A Quick Guide to Grow Lights: Which Should You Use For Your Indoor Farm? Of the countless variables that go into running a successful indoor growing operation, installing the right lighting is one of the more crucial. Even if you have the most advanced greenhouse control system or the best fertilizer, if this one variable is off, your plants won’t be able to reach their maximum growth potential. What type of plants are you growing? How big is your indoor farm? What kind of ventilation is set up? Now that you know what you need, let’s take a look at the different types of lights available for the indoor farm. Light bulbs emit a certain color or range of colors, and the spectrum is measured in degrees Kelvin. Indoor bulbs offer a classic example of the variance in lighting temperature. With indoor grow lights, this range of lighting is often unable to fully duplicate the spectrum of light emitted by the sun. Although most plants will thrive around the 6500k spectrum, flowering plants flourish better in the 2700k spectrum. So, for growing cannabis, flowers, cucumbers, or peppers, you’ll want a low-spectrum light and high-spectrum lights for root crops, leafy greens, or seedlings. There are two critical lighting factors that growers have to take into account for any grow operation: PAR and DLI. Photosynthetically Active Radiation (PAR) defines the type of light required to support photosynthesis—that crucial stage where light energy is converted into chemical energy which is the food plants need to thrive. Although PAR is not a measurement, Daily Light Integral (DLI) is. DLI measures the total amount of light that is delivered to a plant each day. When it comes to assessing the overall growth rate of plants, DLI is the most important metric. Knowing the PAR and DLI requirements of your plants means you’ll be able to set up automatic controls to deliver the right type and amount light every single day. They save you money in the long run. They’re customizable (e.g., choose the precise light spectrum for your plants). They produce less heat and reduce the cooling load. They’re great for all stages of growth. If you can invest in LEDs from the get-go, you’ll earn back your investment in no time and reap the benefits of a truly energy-efficient solution. High-output fluorescent bulbs are three to seven times more efficient than incandescent lamps (whose efficiency rate is around 5 percent). This makes fluorescent lamps, specifically T5s in the 6500k (i.e., “daylight”) range, good for low-budget indoor farms. Fluorescent lamps aren’t considered ideal for large plants because they don’t penetrate as deeply as High-Intensity Discharge (HID) lamps or LEDs. CLFs were designed as a more energy-efficient, longer-lasting alternative to incandescent bulbs and many believe they’re a good option for smaller grow operations and growers on a budget. One good thing about CFLs is that you don’t need complicated wiring or a ballast because they screw straight into a standard socket. However, because CFLs send light in all directions, you might want to invest in a lamp reflector so no light is wasted. 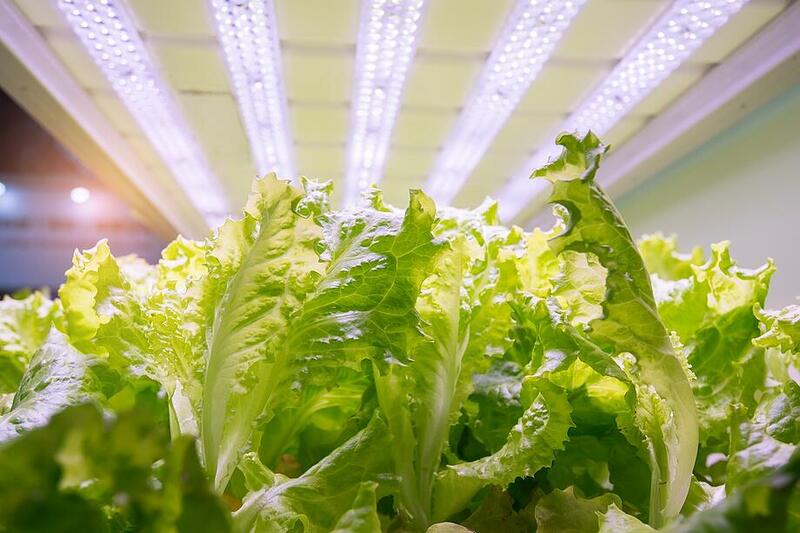 Other than LEDs, HID lamps are a frequent lighting pick for indoor farm operations because they offer high output with efficiency levels that are four to eight times greater than incandescent lamps. Metal Halide Lighting: These lamps provide a crisp, white light and are a good choice for lighting more mature plants in areas where there is little to no natural light. High Pressure Sodium (HPS) Lighting: HPS lamps have traditionally been used to light large areas such as parking lots or warehouses. Producing a warm, white light, HPS lamps should only be used when paired with a good natural light source. HPS lamps have a long lifespan and are a great choice for growers whose plants are at the point of budding and flowering. If you opt to use both types of HID lamps, many fixtures can be modified to incorporate both HPS and metal halide. Mechanical: These are less efficient than their electronic counterpart and may only work with one type of bulb. Electronic: These are often chosen by growers because they are quieter, more efficient, and cheaper, and they usually work with most bulb types. HID lamps have the highest output of all lighting types, but they do emit a great deal of heat, so you must have a ventilation system installed. These lamps work best with larger plants whereas LEDs can work with plants in all stages of growth. Now that you know what type of grow lights will boost your indoor farm operation, it’s time to level up with a grow control system. Grow controllers can help your operation run more efficiently through advanced AI controllers to ensure your plants are getting the right light at the right time in order to increase product quality, maximize yields, conserve water, save money, and more. If you’re ready to learn more, download our Next Level Grow E-Book now. Copyright © 2019 Growlink. All rights reserved.